The Tea Party wall mural will set your kids on a journey to love reading story books. 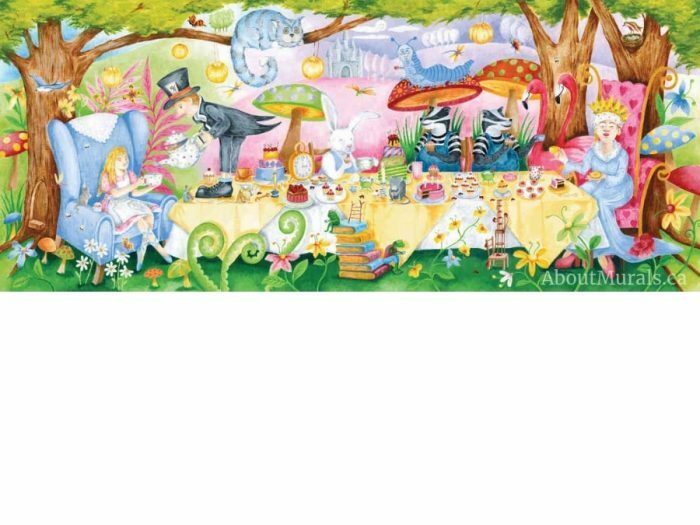 Their imaginations will soar with Alice in Wonderland while she enjoys cake, cupcakes and high tea with the Queen of Hearts, Cheshire Cat, Mad Hatter, Caterpillar and twins on the royal castle grounds. This mural will look like it was painted right on the wall. Why? The painting of Wonderland, with its magical mushrooms and pretty flowers, is scanned using a super high resolution scanner that captures every brush stroke and dollop of paint. It’s then printed on removable wallpaper.